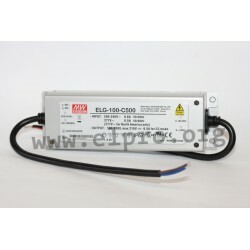 These switching power supplies with constant current in metal enclosure and with universal input are destined for LED and illumination applications in indoor and outdoor areas (IP67). 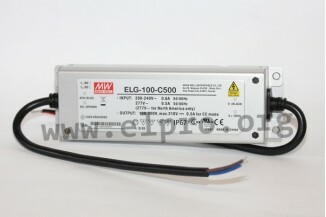 They meet 6kV surge immunity level and are protected against short circuit, overvoltage and overload by current limiting (hiccup, auto recovery). With fixed constant current. We offer the following types by manufacturer Mean Well: ELG-100-C350, ELG-100-C500, ELG-100-C700, ELG-100-C1050 and ELG-100-C1400.